OnePlus One was a major success for OnePlus, as with their first device they were able to create a huge buzz in the flagship smartphone community and it was dubbed as the ‘flagship killer’ of the year. This year, we are going to see the next ‘flagship killer’ from the company again- OnePlus 2, which has been teased by the company several times, and the company has revealed the specs of the device from time to time. OnePlus has been teasing the phone which is to be released on 28th of July, but there were several leaks regarding the specs of the device. Now, looks like PhoneArena has already put their hands on the OnePlus 2 and they have posted the first picture of the OnePlus 2 showing the rear part of the phone. In the images, we can see that the back appears to have a wooden finish, but also there is another possibility that the device may come with a wooden back panel, also there’s a dimple on the back cover. The OnePlus logo is just below the dimple and it is being believed that the dimple is the fingerprint scanner rumored to be part of the kit. We already know that OnePlus 2 will be powered by a Snapdragon 810 chipset along with 4GBLPDDR4 RAM, the first device to get it. The phone will sport a 5.5-inch Full HD 1920 x1080p display. The OnePlus 2 will also have a USB C-Type, the first in a flagship device by a major manufacturer. 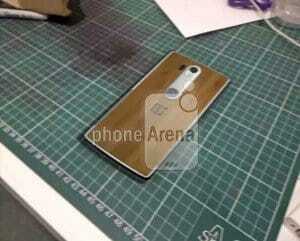 Just a few days back, the company revealed that the phone will come with a built-in fingerprint scanner. Also, OnePlus has revealed that OnePlus 2 won’t cost more than Rs. 28,500. And just a few days ago, OnePlus team confirmed on Reddit that it will pack a 3300mAh battery. So, now let’s have a look at the technical specifications of the OnePlus 2, in case you don’t remember. So, that’s all we know about the next flagship device from OnePlus. Stay tuned for more updates and news, and also daily dose of tech, leaks and rumors. Join us on Facebook and Twitter to stay updated on the go! !